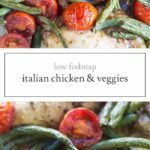 This Low FODMAP Italian Chicken and Veggies is a complete meal in one. This sheet pan meal is also gluten-free and dairy-free. What’s not to love about a one-pan meal? 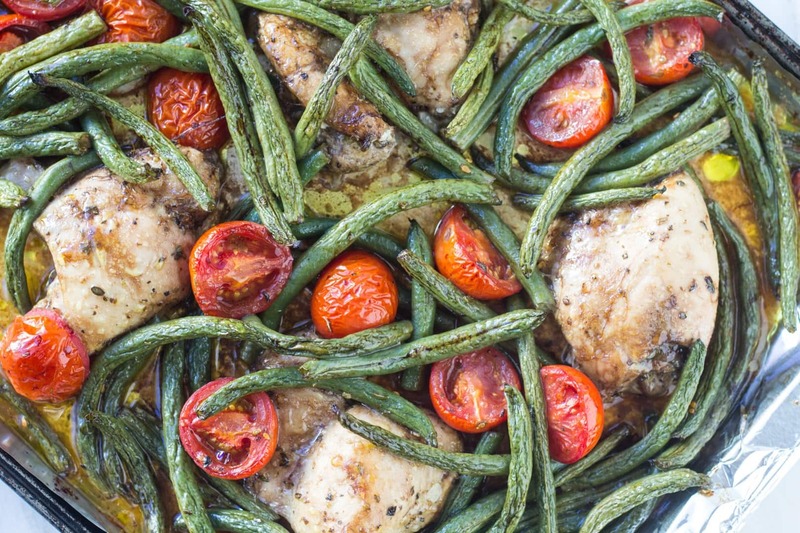 This Low FODMAP Italian Chicken and Veggies is a simple sheet pan meal filled with succulent chicken, green beans, tomatoes and Italian herbs. 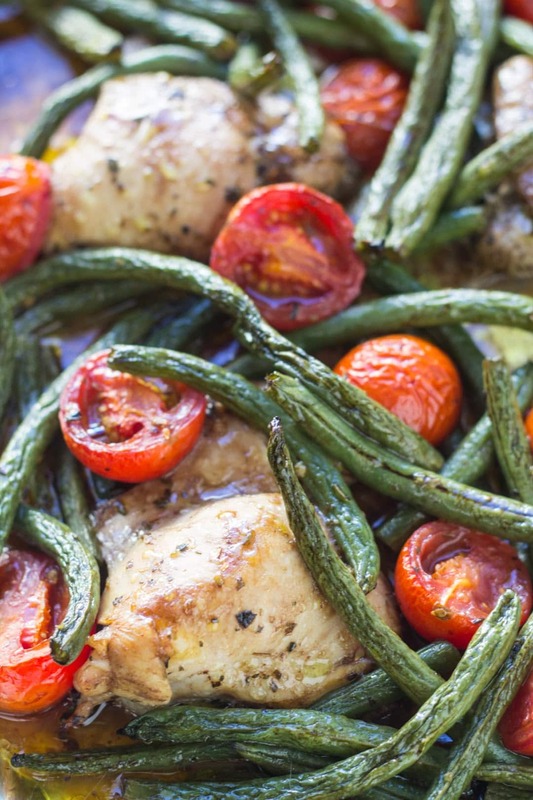 This Low FODMAP Italian Chicken and Veggies is a complete meal in one. This sheet pan meal is also gluten-free, dairy-free, and whole30-friendly. Preheat oven to 425°F. Line a rimmed baking sheet with aluminum foil. Set aside. In a medium bowl, whisk together olive oil, balsamic, dried oregano, and basil. Place chicken in a gallon zip-top bag and add half of the dressing. Seal the bag, toss to mix and set aside. In a second gallon zip-top bag, add halved tomatoes, trimmed green beans and the remaining half of the dressing. Seal and toss to coat. Remove chicken from bag, discarding remaining chicken marinade, and place on baking sheet. Add veggies with marinade onto the baking sheet and arrange everything into a single, even layer. Bake for 25 minutes or until chicken is cooked and veggies are fork-tender. Garnish with fresh basil and serve. Balsamic Vinegar: The low FODMAP serving size for balsamic vinegar is 1 Tbsp. or 21 grams. Cherry Tomatoes: The low FODMAP serving size is 5 cherry tomatoes or 75 grams. 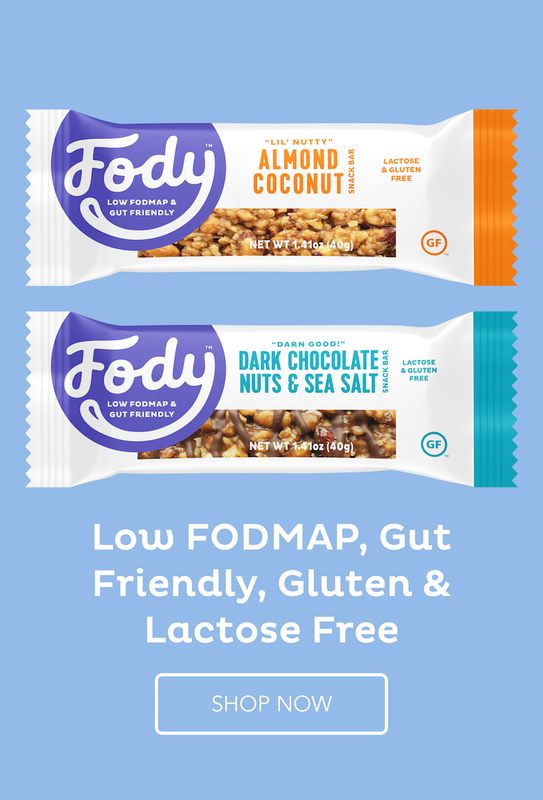 Green Beans: The low FODMAP serving size for green beans is 15 beans or 75 grams. Thanks for the great recipe! Five stars. P.S. I make the Cilantro Lime Chicken all the time. A quick lunch go-to.